On Elementary Season 4 Episode 23, Holmes and Watson find a connection when they discover the perpetrator of the attempt made on Morland's life. When you watch Elementary Season 4 Episode 23 online, Sherlock and Joan continue their investigation into the possible connection between Moriarty and the attempt on the life of Sherlock's father Morland. Sherlock comes to the realization that Moriarty herself was not involved, but her organization was. Rather than collapsing after its head was cut off with her arrest, the criminal enterprise now has a new figurehead. To make matters worse, Krasnov, the man who shot Morland and killed his girlfriend Sabine, has made his way to New York after escaping a Russian prison. He infiltrates Morland's office and sets off a powerful bomb after murdering two people. It's up to Sherlock and Joan to discover the identity of the person who has taken over for Moriarty in a world-spanning organization that has deviously manipulated numerous companies and individuals, as well as caused much death and destruction. There is also the troubling question of the motive in the shooting of Morland and Sabine, which Sherlock realizes makes no sense as a business decision, since it drew Morland's attention to this organization in the first place. Find out what happens when you watch Elementary Season 4 Episode 21 online! 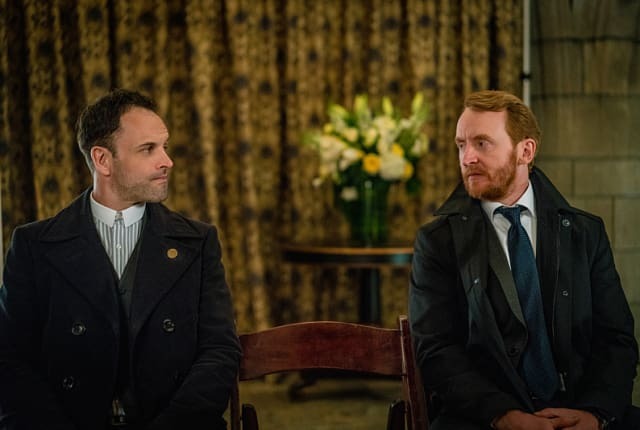 On Elementary Season 4 Episode 23, Holmes and Watson find a shocking connection when they discover the perpetrator behind the attempt made on Morland's life. Moriarty was *not* the Vice President of Inhuman Resources! Permalink: Moriarty was *not* the Vice President of Inhuman Resources! Joan: She puts dates in her little love notes?